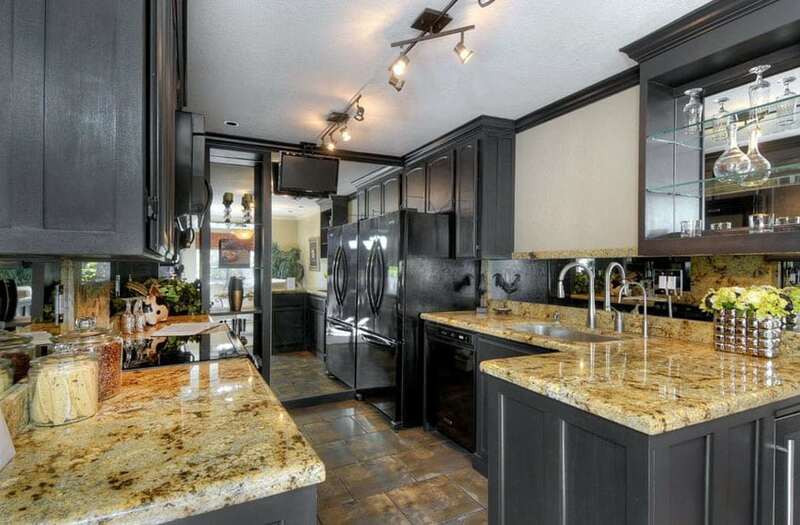 Welcome to our design gallery of small kitchens with dark cabinets. 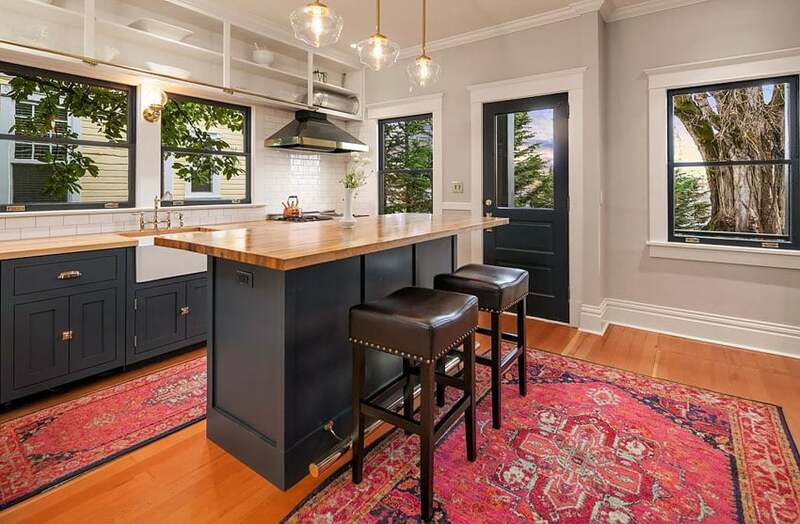 Small kitchen designs offer unique challenges for combining style and function. 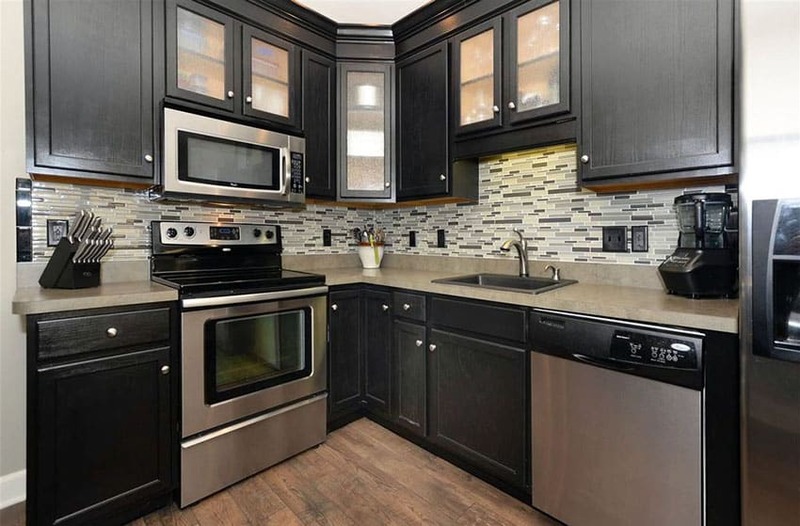 Below are a variety of small kitchen ideas that match dark cabinets with countertops, backsplash and flooring to create a beautiful cooking and dining space. 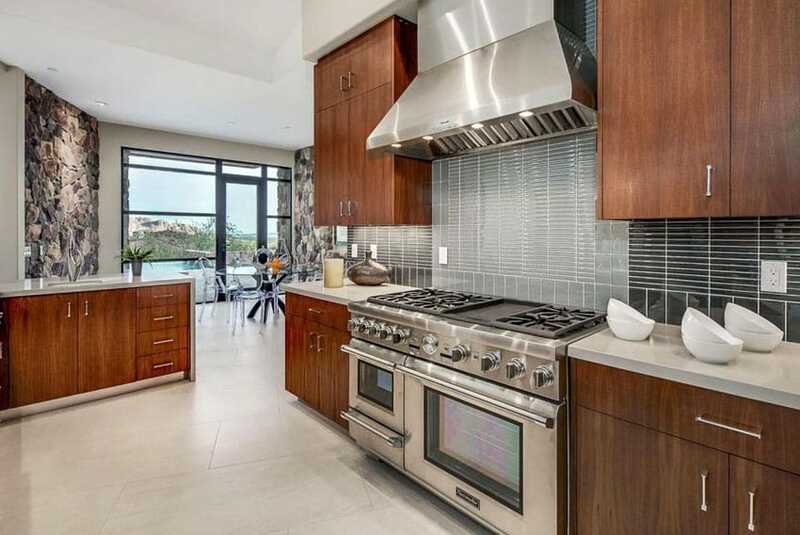 The contemporary kitchen in the picture above features stainless steel appliances which can easily be integrated with the neutral dark brown cabinets and white quartz counter. Top cabinet with smoked glass front provides a perfect mix of extra hidden storage and create bright and dramatic feel. The large window allows natural light to shine through during daytime; at night, the lighting fixture under the wall hanging cabinetry provides ample lighting in the work zone. The exposed brick wall gives this kitchen space added rustic character. Small kitchen may prove to be a design challenge, such as lacking enough counter space, not enough space for the appliances and a restricted working area. But having a small space for a kitchen, doesn’t mean you can’t turn it into your dream kitchen. The secret to creating a fabulous kitchen in a small or limited space is to establish an illusion of making it look larger with a few design techniques. Usually, an open floor plan would make a small kitchen appear and feel larger by allowing the kitchen to flow into the living or dining area. It is also important to remember that in creating an efficient kitchen design, you have to consider – storage, lighting and the appliances you need to incorporate in such a small area. Storage – Don’t be restricted with just the walls of your kitchen, make use of the space in the center as well. By incorporating an island or peninsula in the center of the kitchen, you are actually creating an extra counter and storage space that is also accessible from any point in the kitchen. Adding an island or peninsula can be a challenge for a small space. Portable kitchen islands are available in a variety of sizes for those with limited floor space. Storage is very essential in the kitchen. Maximize your storage capacity as well as work space by installing deeper counters which can be spacious enough for more appliances to be stored or fitted in. Extra-deep drawers provides more storage and can be easily be integrated with the base cabinetry; plus they are more accessible. Make best use of high ceiling for additional storage up top by installing ceiling-height cabinets. Eliminate wasted space and take advantage of extra wall space by incorporating open shelves or built-in hutch. Appliances and Furniture – In small kitchen, limited counter space is always a challenge. Incorporate a functional counter space by using butcher block countertop which could make the most of your preparation area. Take full advantage of adding a kitchen island to achieve more counter space and have the option of having the base open or have some open shelves for additional storage. If you wish to have a seating area by the kitchen island, try incorporating movable seating such as benches which roll out of the way when not in use. This way, you could maximize functionality of the space by making room for food preparation and having a dining area as well. 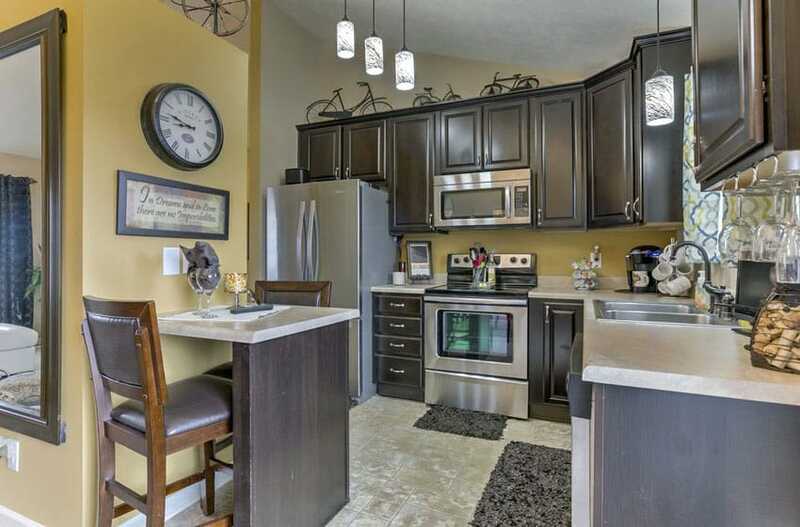 You could also incorporate appliances such as the oven and stove with the kitchen island. Downsizing appliances are the best option when choosing kitchen accessories and devices. Removing small appliances keeps the kitchen space from feeling too cramped and provides more counter space. Downsizing is fast becoming a trend and applied to universal design principles in order to keep the kitchen area looking attractive. Another way of making a small kitchen, look more spacious is by using see-through chairs or bar stools which doesn’t block the view. Lighting – Proper lighting sets the overall feel of any room and area; small kitchens are no exception. Pendant lights and lighting below the cabinets will cast light away from the countertop and backsplash, thus expanding the space and mood of the kitchen. It also helps spotlight the work zones and important areas of the kitchen. Make sure that the lighting are installed where it is needed most. Incorporate lighting fixture which adds drama and decorative element. 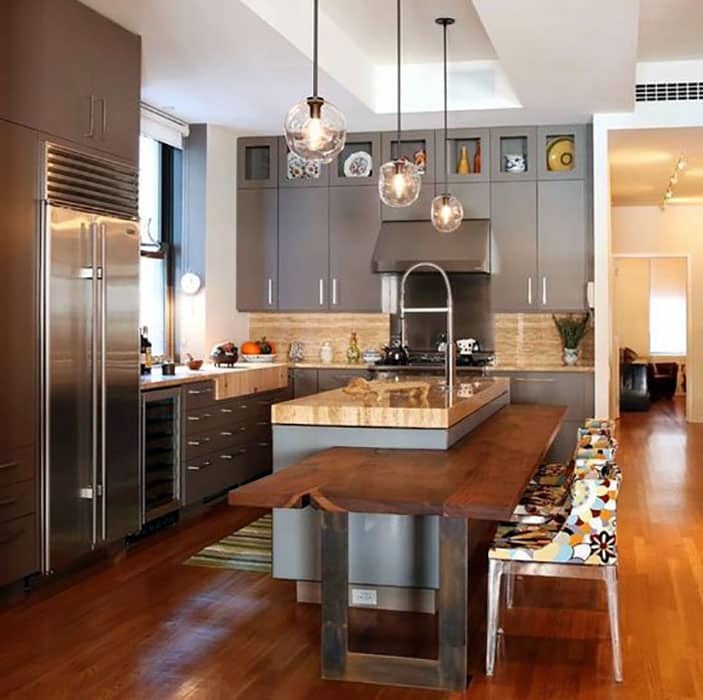 Colors – Light color palette could make a small kitchen feel spacious. Adding a pop of color could also make the kitchen look brighter and fun. You may also add color through window treatments such as fabric curtains, shades and blinds. Most of the time, white is right. White kitchen will never be outdated or be out of style. Accentuate white kitchen design scheme with the kitchen flooring, backsplash, countertop and accessories. Explore more small kitchens with dark cabinets designs and decorating ideas with our collections below. Don’t be afraid to dream big with your small kitchen ideas. Always remember, “Good food, beautiful, welcoming and warm kitchen are what makes a house a home”. The dark cabinetry of this contemporary kitchen incorporates a lot of storage area from drawers to extra cabinets which takes full use of the ceiling height. Top cabinets use glass front panel which reflects general lighting from pendant globe lights across the room. Arctic white counter and antique white walls gives balance to the dark cabinets and medium tone wood flooring. Backsplash protect the walls and at the same time adds style to the design scheme. This glass, black and white graphic mosaic tiles pattern adds accent and a gentle focal point to this compact contemporary kitchen. Balanced by deep-toned cabinetry, white marble countertop and classic white wall. Sleek and simple lines of this contemporary kitchen feature a medium brown toned cabinetry with white Corian countertop balance by light toned flooring and walls creating a feeling of spaciousness. 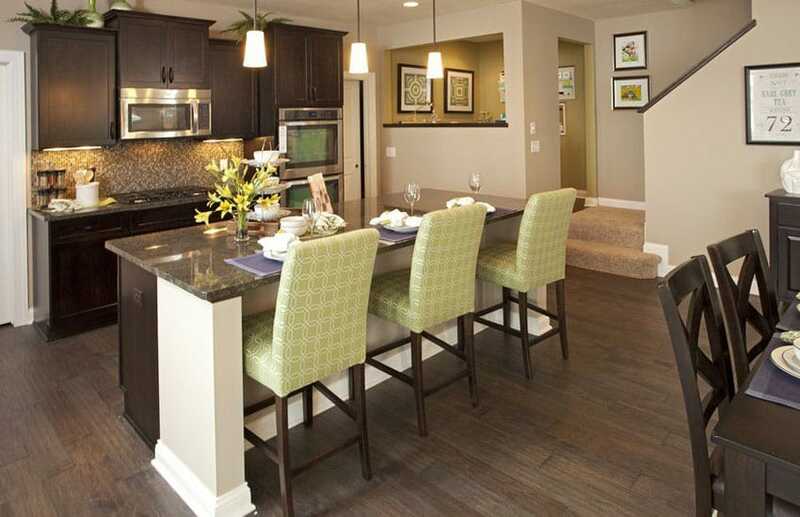 An open floor plan allows this small kitchen to flow into the breakfast nook/dining area. Large paneled picture window and glass door let in adequate natural light into the room. A neutral color two-tone backsplash make a stunning focal point. This contemporary J-shaped kitchen incorporates dark cabinets with light gray granite countertop, neutral stone color backsplash and light natural stone flooring. Stainless steel appliances with its durable, supreme qualities and trendy designs are easily integrated into this kitchen style. Using soft neutral colors for the walls and ceiling, makes this small kitchen feel open and light. This U-shape kitchen features clean and light hues, making this contemporary kitchen very stylish. Frosted glass front cabinetry creates a trendy style, perfect with the simple and clean lines of the flat panel cabinet doors and the light gray quartz countertop. This gorgeous kitchen features an open layout and using medium toned wood flooring which extends throughout the floor area. This maple wood flooring and the wooden breakfast bar island create a warm and welcoming feel. Neutral colored kitchen cabinets made full use of the ceiling height and added more accessible storage by incorporating a lot of deep drawers. For additional space, the designer incorporates a special storage for a refrigerator under counter for chilling wines. An open floor plan could make a small kitchen feel larger because it allows the space to be free-flowing. A granite-top breakfast bar island functions as an informal dining, extra work space and at the same time separates the kitchen from the other parts of the house. Hickory floors extends through the hallway and common areas. Craftsman cabinetry features a Shaker design for the door panels. This contemporary L-shape kitchen features black kitchen cabinets balanced by wall hanging cabinets with glass front panel. Lights inside these glass front panel cabinets helps uplifts and make this small kitchen brighter. 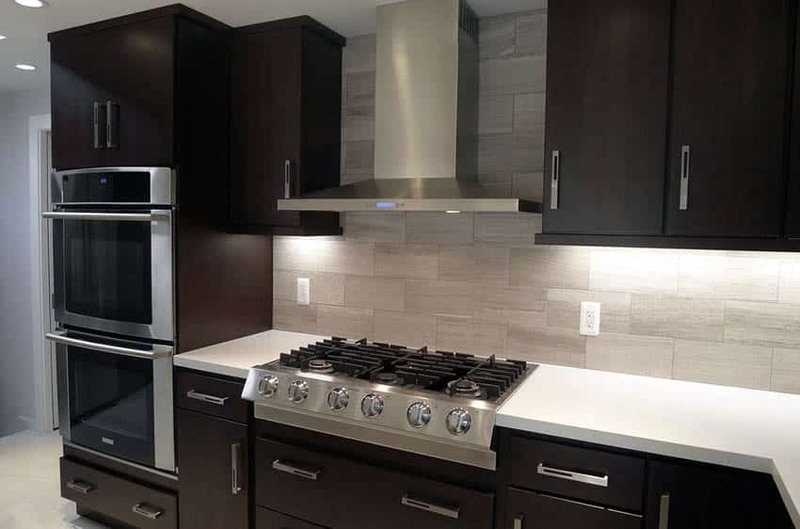 Light tone matchstick glass mosaic backsplash, cool neutral tone countertop and stainless steel appliances creates a perfectly elegant kitchen scheme. 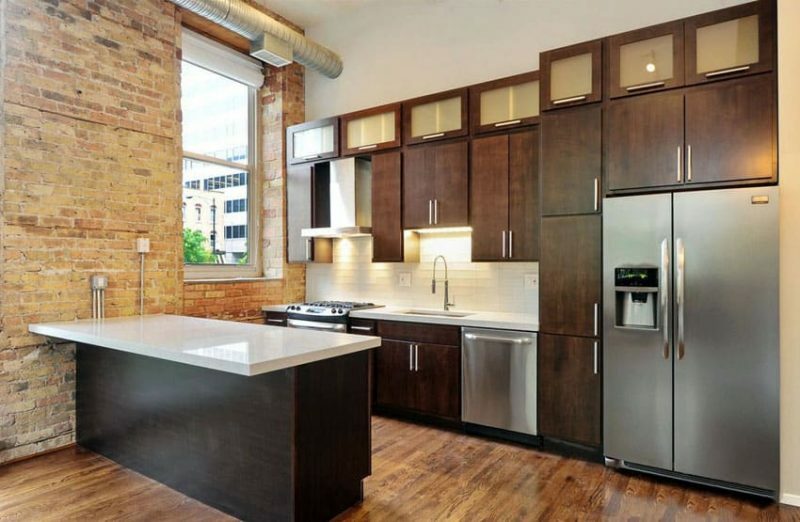 This studio-type contemporary one-line kitchen features dark cabinets and stainless steel appliances. The big picture window allows plenty of natural light to shine through the room. The drop ceiling allows more drop lights to be installed for ample lighting in the absence of natural light. Medium tone wooden flooring provides balance to the design and color scheme. 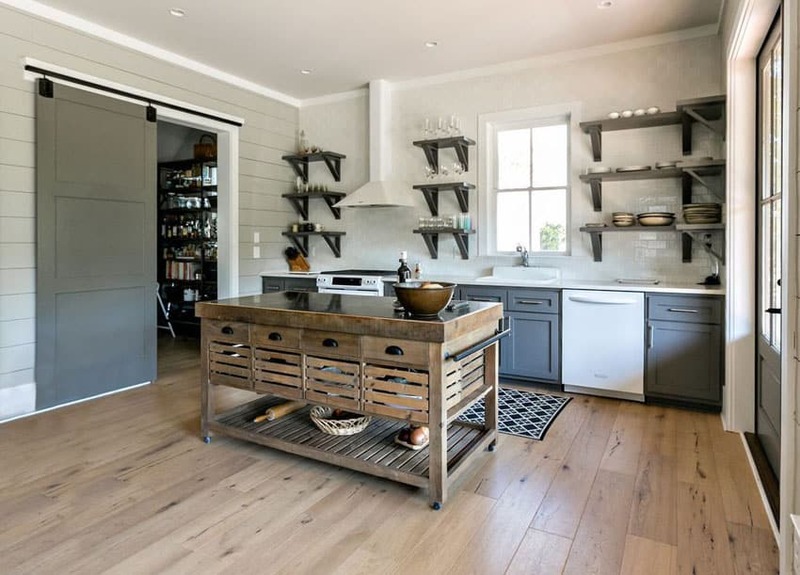 This Craftsman kitchen features a sliding barn door and a customized portable wooden island. Simple and dynamic open shelves replaced the wall hanging cabinetry. Cool neutral color hues and an open floor plan make this small kitchen look and feel more spacious. The whole design scheme gives a warm and welcoming feeling. Another L-shape open floor plan idea incorporates custom made cabinetry in dark wood finish and light tone backsplash and flooring. 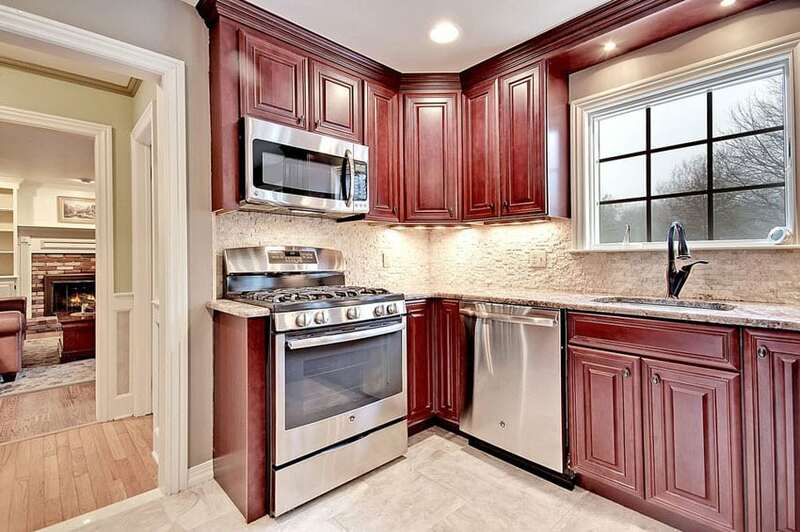 Stainless steel appliances offsets and balances the color scheme. Different heights for the hanging wall cabinetry gives this kitchen some added design style. This L-shape small kitchen design flows and opens up to the dining area and combined with a peninsula which separates the kitchen from the living room area and adds more working space. Glass panel wall cabinetry breaks up the cabinet blocks and mosaic multi-colored backsplash adds some design interest. 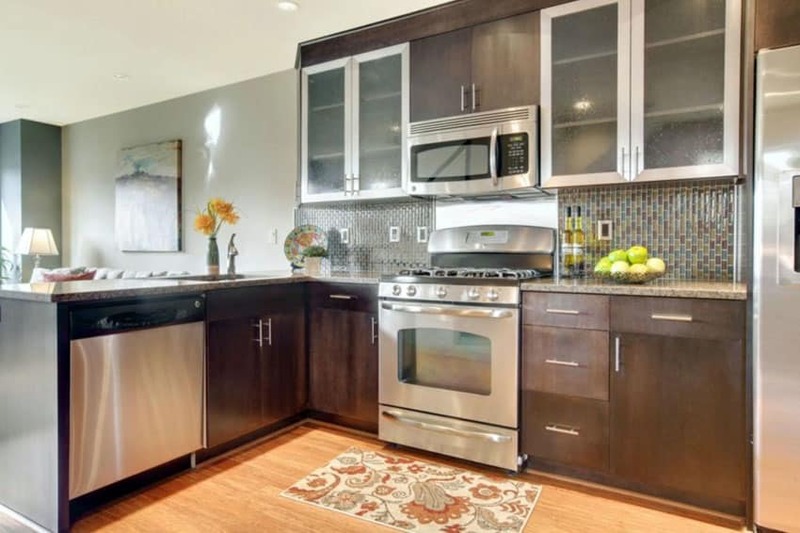 Stainless steel appliances which are properly laid out are accessible to all and eliminates wasted steps. 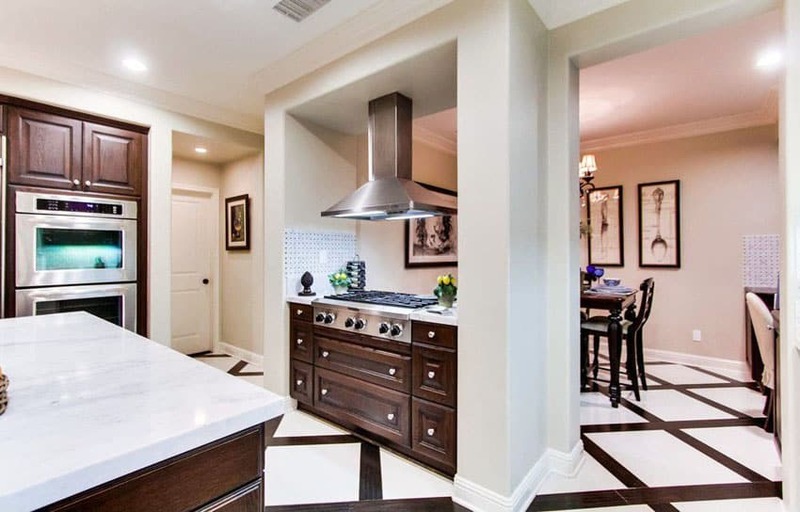 This luxurious kitchen features dark raised panel cabinetry which blends well with the patterned flooring. White Calacatta marble counter and neutral color walls balances the color scheme, giving this small kitchen an elegant design scheme. By incorporating a built-in cooktop on a peninsula provides accessibility to both kitchen and dining room and functions as a division to both areas at the same time. This free-flowing open layout design scheme incorporates an island counter for added storage and functions as an informal dining area providing additional counter space and seating area. 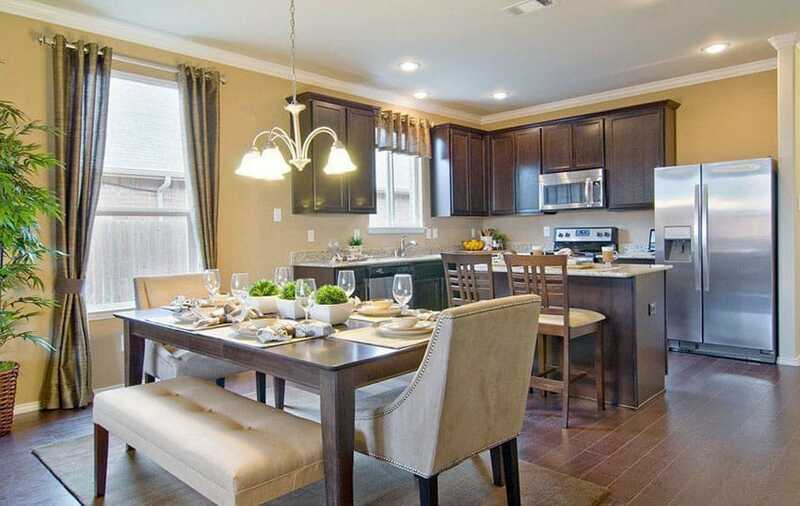 The mustard colored painted walls blend well with the dark tone kitchen cabinetry and light tone furniture upholstery. The Hickory flooring adds a rich character to this stylish home. This traditional kitchen incorporates dark raised panel cabinetry combined with stainless steel appliances and light tone flooring. Make use of the extra wall space that can be easily transformed into a one-person dining peninsula, which doubles as a duty workstation for meal planning or study area. 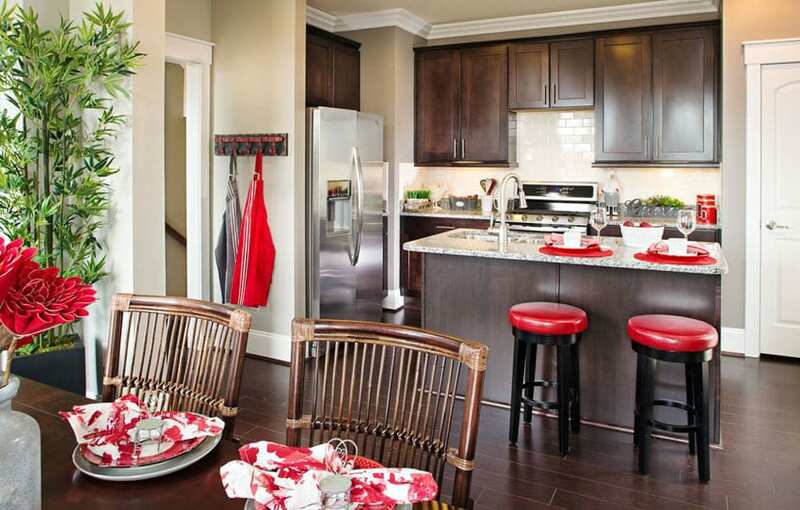 A splash of red color gives this traditional kitchen a vibrant feel. An island divides the kitchen from the main dining area and at the same time provides additional seating, storage and more counter space. 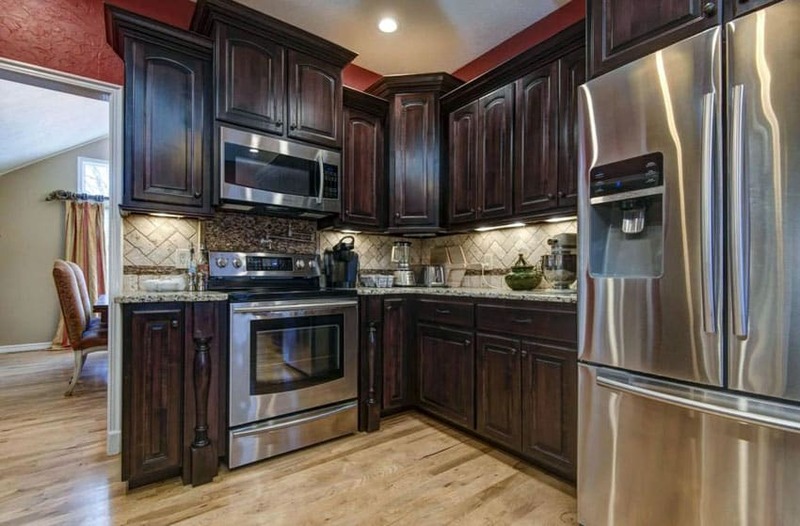 The dark tone cabinetry blends well with the dark flooring. 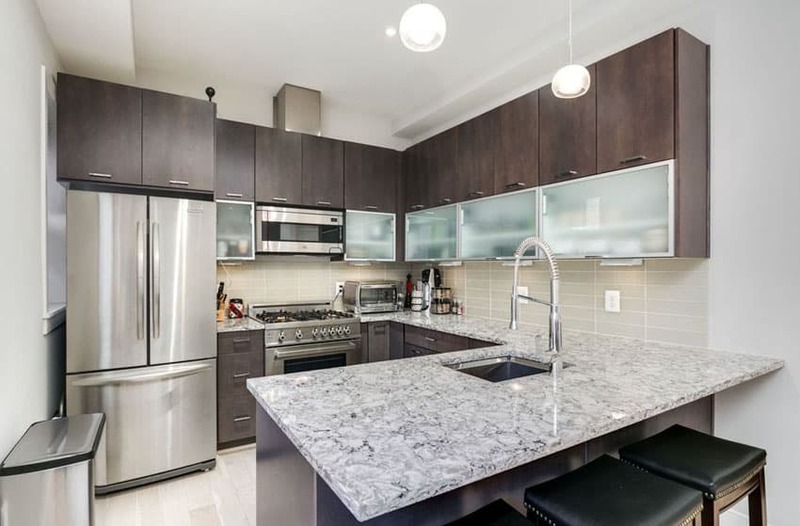 Light granite counter, white subway tiles backsplash, cream painted walls and stainless steel appliances balances the color scheme making the room feel more spacious. 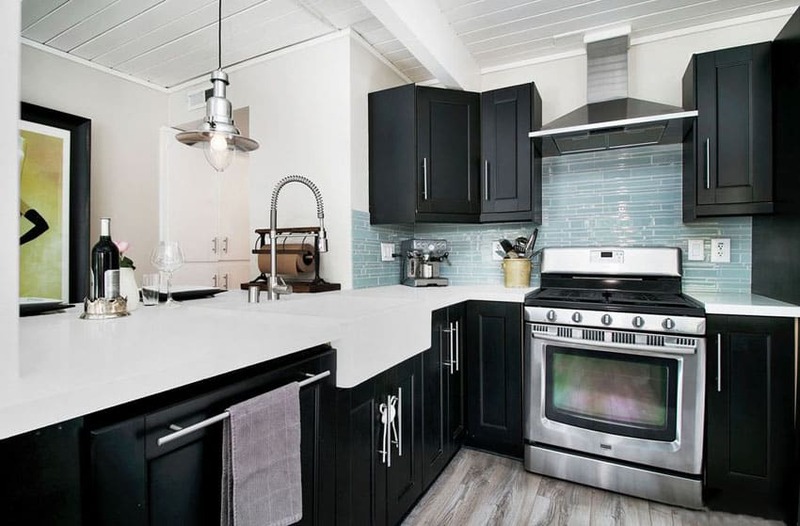 This image is a good example of how small kitchens with dark cabinets can utilize decor to brighten up a space and add your own personal touch to the design. 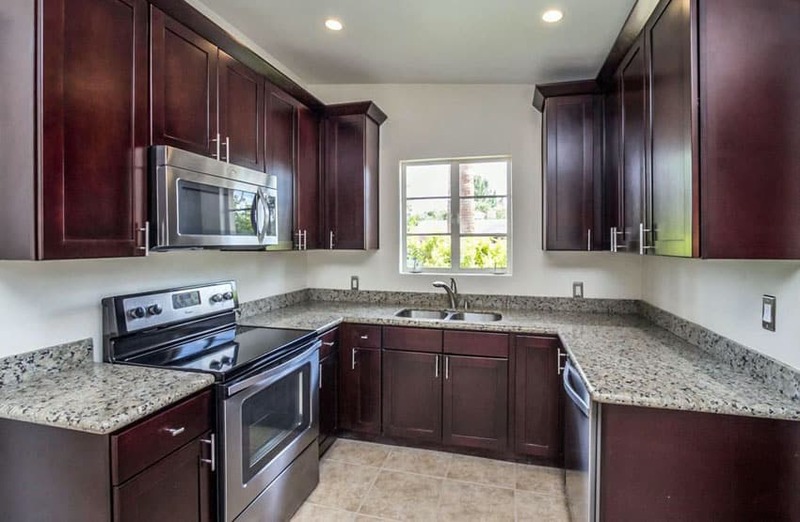 This traditional style kitchen features dark red raised panel cabinetry with light marble countertop, neutral tone stone backsplash and light ceramic tile flooring give an overall warm and open feel. The large window allows ample natural light to come in and breaks the cabinet blocks creating more design style. 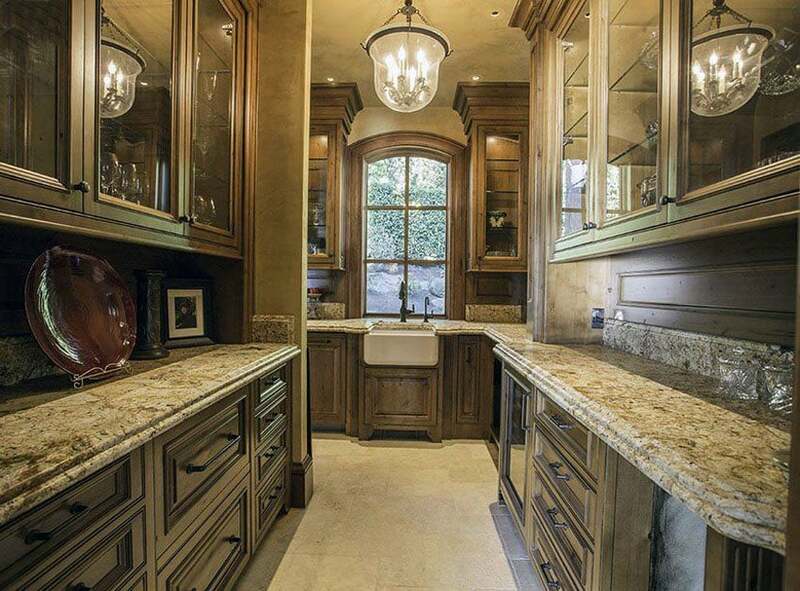 This traditional style small galley kitchen has raised panel custom wood cabinetry provide lots of storage space. Glass front panel wall hanging cabinets create an open feeling to this narrow kitchen. Cream granite countertop combined with light tone travertine floors offsets the tapered kitchen walk way. Pendant light fixtures serve as a decorative element in this design style. Farmhouse sink gives this kitchen an iconic appeal and features a focal point adding more drama to the design scheme. 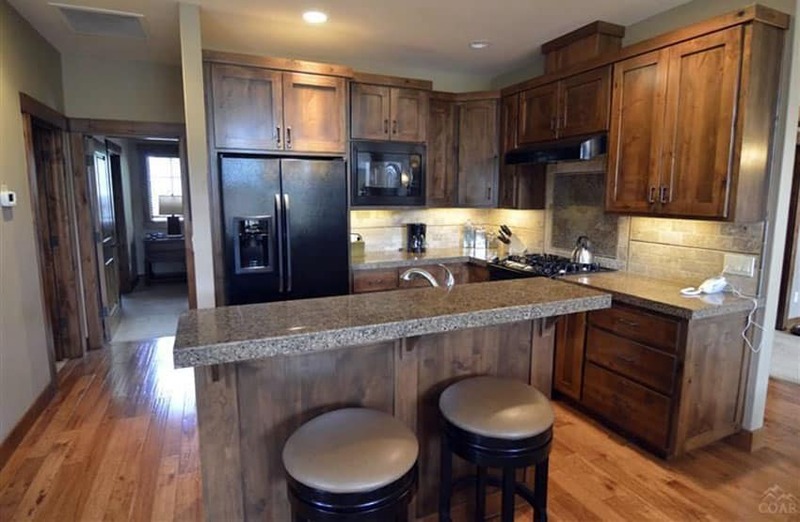 A traditional kitchen showcases a dark craftsman style cabinetry, light quartz countertop and dark tone wood flooring. The lines and design style of the cabinets directs the eye upward giving an impression of a higher ceiling. An elegant traditional kitchen showcasing dark wood flat panel cabinets and dining furniture set. Medium tone wooden floor complement the soft hues of the walls and upholstery. One-level kitchen island provides more storage space without blocking any view of this open layout design scheme. Multi-level and different depth of the wall cabinets adds style and personal appeal to the design. 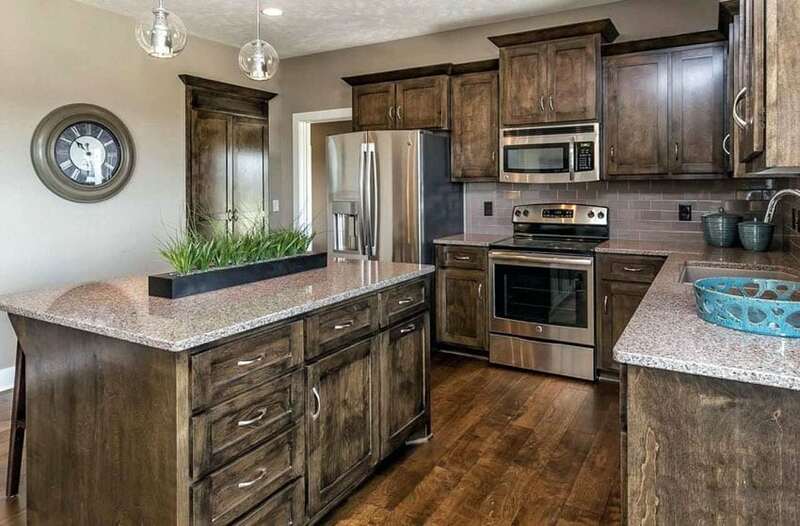 If you want a bold color in your kitchen, let us suggest that the best way to go is opt for a dark tone cabinetry and balance it off with neutral painted walls, light tone countertop and flooring. This U-shape kitchen is a good example – Shaker style cabinets in dark mahogany finish with light neutral granite countertop, classic white painted walls and light tone ceramic tile flooring. 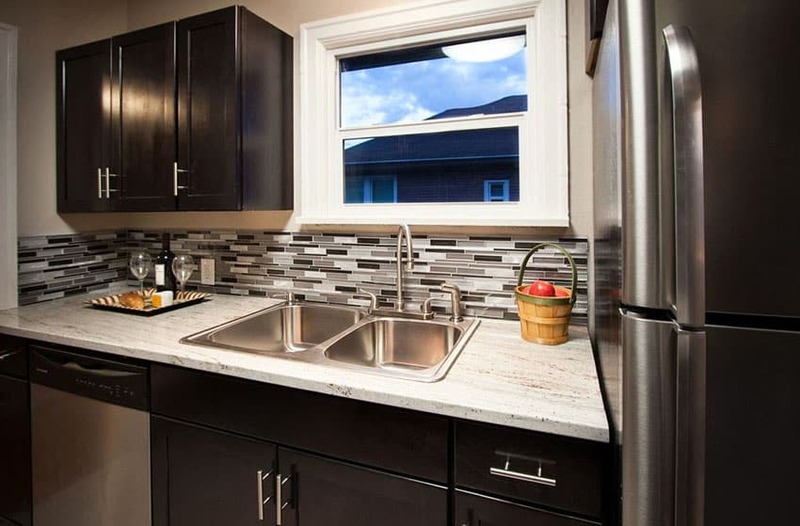 A window by the kitchen sink allows natural light to come in and at the same time breaks the block cabinetry. 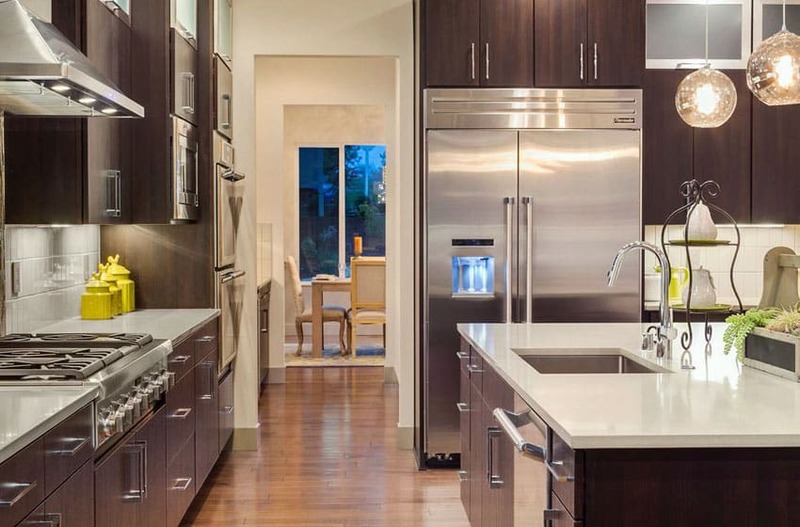 Stainless steel appliances are incorporated to cut into the monotony of the base cabinets. Small kitchens with dark cabinets are often paired with white countertops to lighten things up. The clean lines of this contemporary U-shaped kitchen prevent the space from appearing small. Neutral color painted walls, glazed white tiles backsplash and arctic white countertop and waterfall peninsula balance the deep-toned cabinetry and flooring. 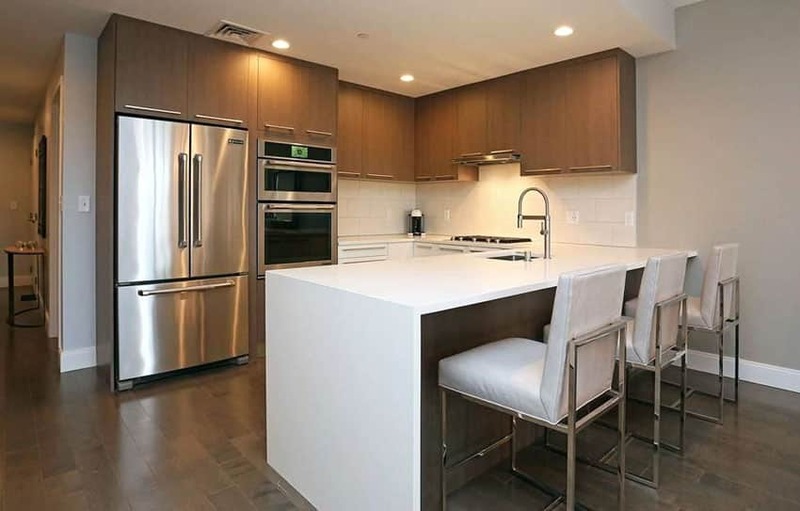 Stainless steel appliances and chrome finish bar chairs gives a touch of modernism in this design scheme. Visit this page for more small kitchens with white cabinets. As a general rule of thumb using black cabinets in a small kitchen space is not advised since it can make the space appear even smaller. However, with that said there are some creative ways to use black cabinetry and still get the beautiful kitchen you want. For starters with a small kitchen its important to maximize lighting. This includes the use of natural light such as from windows and skylights to help keep the space as bright as possible. It is also a good idea when using black cabinets to create contrast. This can be achieved in a variety of ways such as using a light color countertop, backsplash tiles, wall color or flooring. Black is beautiful, even in a small kitchen like this. 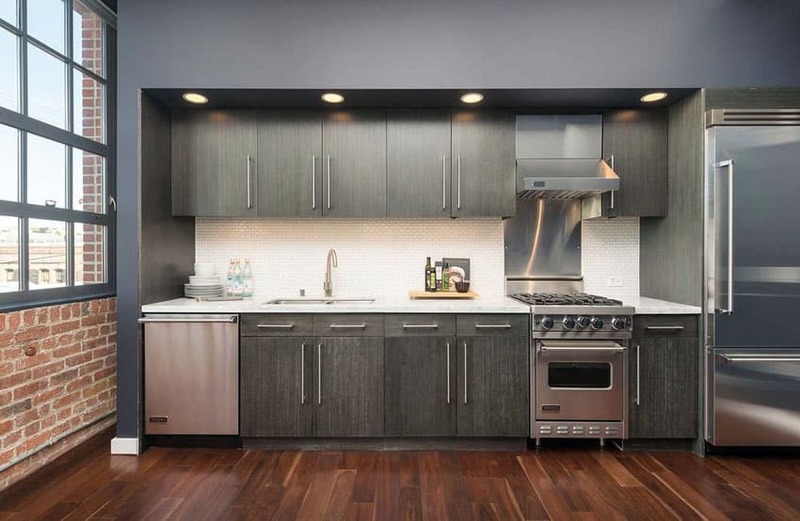 Black Shaker front panel cabinetry combined with artic white countertop and blue glass backsplash light flooring and stainless steel appliances are seamless, simple and perfect combination. There are different ideas incorporated in this small transitional kitchen such as installing open shelves instead of wall hanging cabinets making way for more windows which allows natural light to come in from any direction and provides more ventilation. Butcher block countertop is a timeless design element which adds natural warmth to this kitchen. It is durable, functional and easy to maintain. Pendant lights above the island adds drama to the overall design scheme. 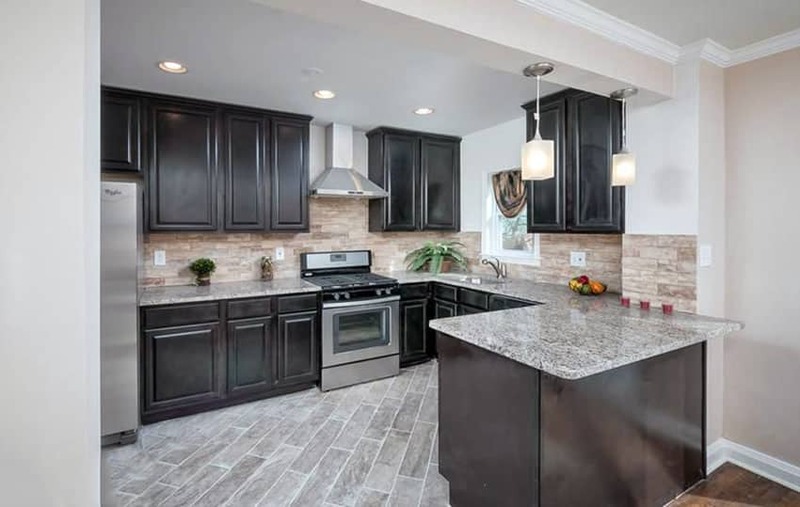 Dark cabinetry looks so classy and elegant for this transitional kitchen style. Cream granite counters and backsplash, open glass shelves and medium tone flooring balanced off the colors used in this kitchen. Track lights enables the different working areas to be well illuminated. This stylish space features a small modern kitchen with dark cabinets that is contrasted by arctic white quartz countertops and honed marble tile backsplash. the cabinets themselves are a stained white oak that is available in an assortment of shades to match your design plan.